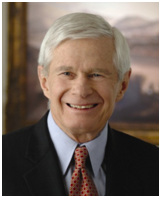 Fred Malek is Founder and Chairman of Thayer Lodging, a Brookfield Company. Thayer has acquired over $3 billion of hotel assets and has consistently earned top returns for investors. In addition to his business activities, Mr. Malek served on and was Chairman of the Board of Visitors of West Point, and is currently Chairman of the Republican Governors Association Executive Roundtable, Finance Chairman of Republican Governors Association, Founder and Board Member of the American Action Network, Chairman of the Congressional Leadership Fund, Founder and Chairman of the American Action Forum, Chairman of the American Friends of the Czech Republic, and Chairman of the Woodrow Wilson International Center for Scholars. He also serves on the Board of Directors of CB Richard Ellis. In his earlier investment activities Mr. Malek led the acquisition of the Ritz Carlton Hotel Company, was one of three leaders in the acquisition of Northwest Airlines, led the acquisition of CBRE, and was a partner with former President George W. Bush in owning the Texas Rangers Baseball Club. Previously in his business career, Mr. Malek was President and CEO of Marriott Hotels, President and CEO of Northwest Airlines, and Co-Chairman of CBRE. During his eight year tenure as president of Marriott Hotels profits quintupled, and the stock increased eight fold. In addition to his business career, Mr. Malek has served as an advisor to four U.S. Presidents. He entered government as Deputy Undersecretary of the Department of Health, Education and Welfare. He later became Special Assistant to the President of the United States, and Deputy Director of the U.S. Office of Management and Budget under Presidents Nixon and Ford. Mr. Malek advised President Reagan as a member of the executive committee of the President’s Council on Cost Control, as a member of the President’s Commission on Private Sector Initiatives, and as a member of the President’s Council on Physical Fitness and Sports. He served President George H. W. Bush as Director of the 1988 Republican Convention, as Director of the 1990 Economic Summit of Industrialized Nations with the lifetime rank of Ambassador, and as Campaign Manager during 1992. Mr. Malek served as National Finance Chairman for the 2008 McCain Presidential Campaign, and served on Governor Mitt Romney’s National Finance Committee in 2012. Center in Aspen; and the Marlene and Fred Malek School of Health Professions at Marymount University. He also served as one of two Co-Chairmen leading West Point’s largest ever capital campaign, serves on the Board and Executive Committee of the Aspen Institute, and the American-Israel Friendship League. Mr. Malek has received a number of awards in his career. He received the 2014 Distinguished Graduate award from West Point (West Point’s highest honor), the ADL Achievement Award from the Anti-Defamation League, and was inducted into the Horatio Alger Society. His awards also include being named one of the five most outstanding graduates of the century from Morton High School in Cicero, Illinois, the Woodrow Wilson Award for Corporate Citizenship, the Harvard Business School’s Business Statesman Award, the American Friends of the Czech Republic’s Civil Society Vision Award, the Boy Scouts of America’s Citizen of the Year Award, the sister Majella Berg award, Marymount University’s highest honor, the Churchill Centre Leadership Award, and was elected to the Washington Business Hall of Fame. He has appeared frequently on television news shows including as guest host of CNBC’s Squawk Box, and numerous appearances on Fox News, Meet the Press, Fox Sunday, and Face the Nation. Mr. Malek is a graduate of West Point and the Harvard Business School, and was an Army airborne ranger serving with a special forces (Green Beret) team in Vietnam. He resides with his wife in McLean, Virginia, and is the proud parent of two children and Grandfather of five. Besides family, his passions include biking, hiking, and cross country skiing.